The second coming has arrived and it\'s highly uncivilized. 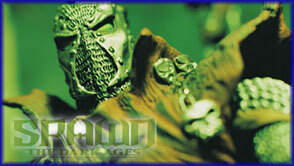 A barbaric blend of sculptures that synopsize the grit and raw detail of the classic McFarlane Hellspawn. Inspired from the lineage of greatness that defined the first series, Spawn the Dark Ages II is an unrefined expression of superhuman strength and savagery that will outwit and outstare even the bravest of onlookers.